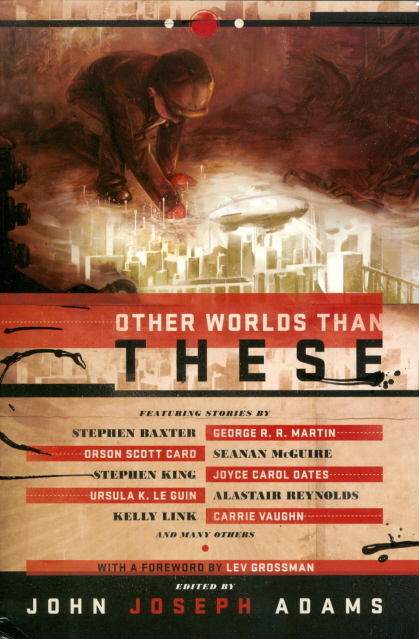 Just received in the post, my contributor's copy of John Joseph Adams' anthology Other Worlds Than These, a collection of tales of travels to and from other histories and alternate realities. It reprints my story, 'A Brief Guide To Other Histories', which shares the various interconnected histories of my novel Cowboy Angels. 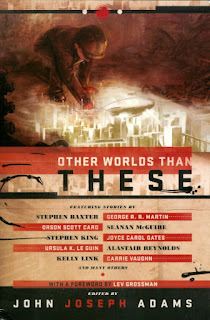 You can find out more about the anthology here, and more about my story in a brief interview, one of seventeen between the editor and contributors. Meanwhile, the last draft of Evening's Empires (or at least, the last before it's fired off to its editor) moves on, from Tannhauser Gate to a wheel habitat at the outer edge of the Saturn System. And here's something randomly lovely: a flash choir in New York's Times Square, singing a new composition by Philip Glass (who provided much of the soundtrack for Evening's Empires) in honour of his 75th birthday. McLean Fahnestock made 'Grand Finale', a compilation of all 135 shuttle launches, almost a year ago; it was a finalist in the Remix category of the 2012 Vimeo video awards. It's a celebration of the visceral power of rocket technology, but it's also a requiem. Watch right until the end. This is how tragedy enters global awareness: a babbling chorus gradually falling away until only a single voice is left. ﻿When I was a teenager, living at the edge of a small town in the Cotswolds, England, I was a ferocious reader. And what I mostly read was science fiction. I read everything I could find in the public library, and in the library of my school (which possessed, for instance, a complete set of the works of H.G. Wells). And I spent a significant fraction of my pocket money on paperbacks, new and old. I hunted down caches of SF paperbacks in the backs of bookshops, on spinners in newsagent shops, in church sales. And every week I scoured the trays of cheap, imported paperbacks and magazines that the local Woolworths set out on one of its counters. I still have a few of those Woolworths books. John Jakes’ The Asylum World. Clifford Simak’s All The Traps of Earth. 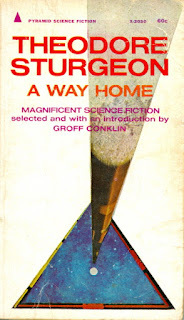 And Theodore Sturgeon’s A Way Home, a Pyramid paperback edition of a short-story collection first published in the year that I was born, 1955, reprinted several times over the next decade. The edition I have is the fourth printing, with the historically significant date July 1969. I suppose I bought it a year or two later. When I was 15, or 16. In 1970, or 1971. I’d read a lot of science fiction by then. I was, by then, deep into the New Wave - Michael Moorcock and Joanna Russ, Tom Disch and Samuel R Delany, Keith Roberts and M John Harrison. But I knew and loved Sturgeon’s work, and knew he was one of the authors on whose shoulders the New Wave guys were standing. And one of those stories in the collection, the title story, spoke to me in the way that short stories can sometimes speak to us. I felt a jolt of recognition, as I read it. A thump in the secret chambers of my heart. It wasn’t just that the protagonist was a young kid named Paul, although I was still young enough for that to seem significant. And it wasn’t just that Paul, Paul Roundenbush, lived in a small town - in the Midwest, yes, and smaller and sleepier than my home town, but still. No, what really spoke to me was that, like me, Paul wanted to escape. I wanted to leave home, too. I was 15, or maybe 16. Old enough to realise how small my home town was, to have some idea of the world beyond it. Like Paul Roundenbush I was a smart, strange, dreamy kid. A loner. And like a lot of smart, dreamy, lonely kids who feel out of place in the place they grew up in, I read a lot of science fiction. I’m sure that some of you feel a little jolt of recognition at this point. In ‘A Way Home’, Paul, Paul Roundenbush, meets, or rather dreams of meeting, three possible future selves. They’re exactly the kind of men a lonely kid eager to escape his small town would dream of becoming. A millionaire with a glamourous wife and an expensive car and a glove box full of chocolate-covered cherries. A hobo who lives outside the law and has travelled the whole wide world. And an air ace exactly like a hero from a pulp story. I never ran away, and neither does Paul Roundenbush, in the end, but with typically tender precision Sturgeon exactly nails the longing, the oceanic transcendental longing, of wanting to be somewhere else that almost all kids feel, at some point. That I felt, very strongly, then, in 1970 or 1971, in that small Cotswolds town, when I found the Pyramid paperback edition of A Way Home in the Woolworths tray, under a slew of Spicy Detective Story magazines and remaindered hardbacks. Is it really science fiction, ‘A Way Home’? 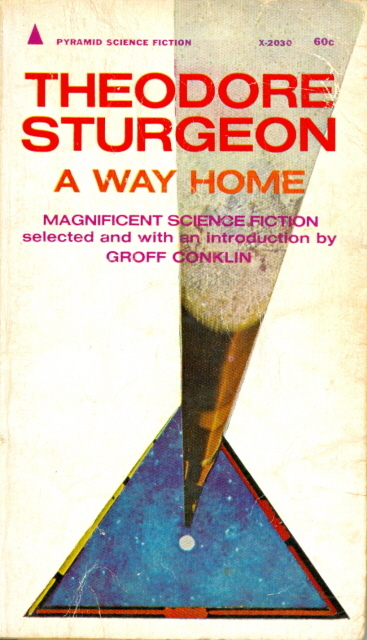 It was first published in a science-fiction magazine, Amazing Stories, and Sturgeon was best known as a science-fiction writer. But because almost everything happens in Paul’s imagination, because its movement is small and close and personal, it reads as a straight literary story. Maybe it bounced from Colliers before finding a home in Amazing. Or from the Saturday Evening Post. But its theme is the theme of many science fiction stories. A yearning to move out, always further out. To become more than you are. And also the flipside of that yearning: the return home after long voyages to strange harbours, and knowing yourself, and where you came from, for the first time. As in Joe Haldeman’s The Forever War, for instance. Or James Blish’s short story ‘Watershed’. And many others. I’ve published eighteen novels and more than eighty stories, and I know that it’s a theme that I’ve returned to over and again. It is, definitely, the theme of ‘The Choice’. Its young protagonist, Lucas, doesn’t want to leave home, does all he can to stay, until circumstances force him to make a hard decision. But I think that it shares, absolutely, the same concerns, the same movements of the human heart, as ‘A Way Home’. And for that reason, beyond all the usual reasons, I’m amazingly proud and happy that ‘The Choice’ has won the Theodore Sturgeon Memorial Award. I would like to thank Sheila Williams and Asimov’s Science Fiction magazine for publishing it, and the award’s judges for choosing it. And most of all I would like to thank Theodore Sturgeon, for his stories, for showing me how.